The latest APOC reports are out for Anchorage’s spring elections and they give us pretty good clues to who’s contending, who’s pretending, who’s hoping to get paid, and who’s putting their members’ money where their mouths are. Anchorage Assembly candidates and interest groups are required to file updated campaign financial disclosures 30 days before the election. This year that deadline happened to be last Monday evening by midnight. 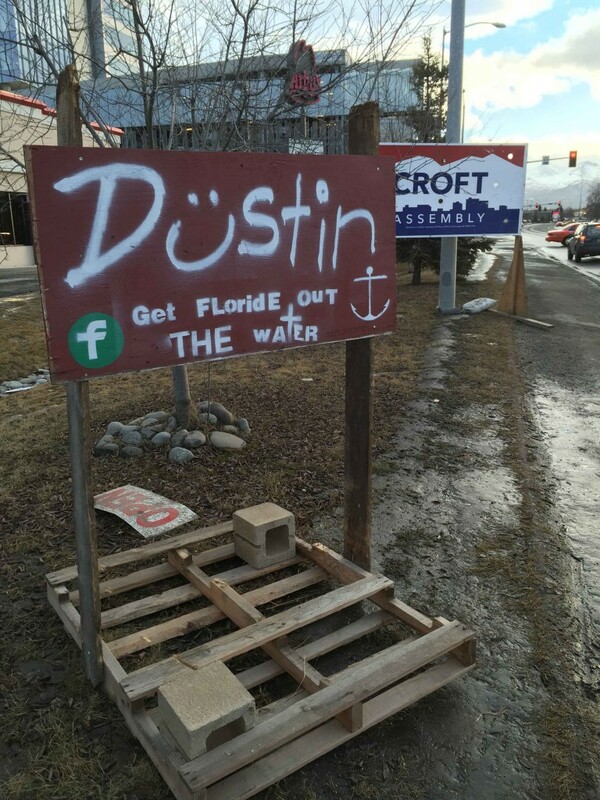 APDEA made it pretty clear who they are supporting in this spring’s Anchorage elections. They too leave little no doubt who they support. There already seems to be some patterns emerging. 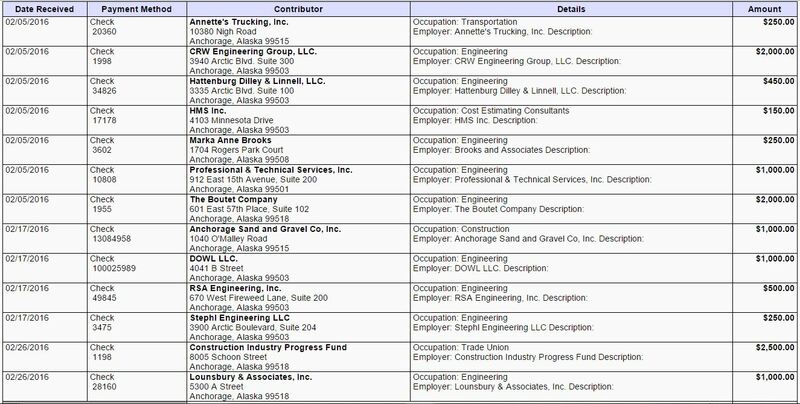 These labor folks spread a smattering of donations across municipal races in Anchorage, Fairbanks, and Juneau. They also spent almost $7K on polling. The group raised only $718. You would expect better fundraising from a group that sports some big name supporters and has shown the energy to gather the signatures to get this on the ballot. It would seem that other than a donation from former Superintendent Carol Comeau this group’s donor list is not made up of those who support education as much as those who support getting contracts related to building things used for education. Shocking. You can click on the pic to enlarge. Anchorage Tomorrow — Organized to encourage and promote the creation, maintenance, expansion, and staffing of municipal facilities. They support passing municipal bonds on the spring ballot. They raised $14,684. Just like School Bonds Yes!, their money came exclusively from engineering firms, architects, and contractors that would benefit from the work paid for by the bonds. She raised $16,000 in just a few weeks. Her donors were GOP stalwarts like the Spinelli’s, Larry Partusch, and Tom McGrath. He raised $9,600, $3,000 of which was his. That is a surprisingly low number from a candidate with Begich’s pedigree. Dunbar raised another $14, 334 this period, bringing his total to $53,249 for the election cycle. That included another $3,000 in union donations. He spent just over $32K in the same period. That included over $19K in radio ad buys. Dunbar still has another $17K in cash on hand. Gales raised $5,535. His largest donors included Chuck Spinelli, Jim Jansen, and Sen. Cathy Geisel’s husband Richard. The problem for Gales is he has only raised $5,776 to date, but has a debt of $9,036 to his campaign consultants Dittman Research. That debt doesn’t appear to include any media buys. Croft brought in another $7,700 this period to bring his total to $74,178. These numbers include another $3,000 in union contributions. That is pretty darn good. As a matter of fact it may be so good Croft doesn’t feel he needs to raise anymore. The flyer for his big fundraiser at Mayor Ethan Berkowitz’ house this Thursday promises it will be Croft’s “final” one. Croft has purchased almost $16,000 in radio ads and still has over $27K cash on hand. Trombley raised $17,146 this period for a total of $50,371 for the cycle. He raised a lot of that from builders and contractors. In true conservative fashion Trombley only spent about $13K so far, leaving $37K for ad buys and other spending the last month of the campaign. Ira! raised another $9K this period bring his cycle total to a very respectable $55K. His major donors included the Gottstiens, Brad Keithley, and Rick Mystrom. No PAC money for Ira!, though. After repaying over $5K in loans he has personally made to his campaign, IRA! will have about $10K left. Not a bad report for an independent candidate. Darden didn’t file a 30 day report presumably because he hasn’t and doesn’t plan to raise or spend enough to trigger APOC reporting rules. And That is odd because his boldly effective signs say nothing if not “quality design team”. Weddleton raised $11,916 this period bringing his total to just shy of $54K. Donations this period came from an interesting blend of unions, Democrat like Pete Pederson, Harriet Drummond, and Chris Schutte, and Republican business donors like Dimond Center owner Hugh Ashlock. Weddleton still has $18K cash on hand, but carries a pretty big $11K debt to his campaign consultants for radio ad buys. That means he has about $7,000 unspent at this point. Taylor didn’t get into the race until the last minute and then promptly took a vacation, so it isn’t a huge surprise that his fundraising numbers have lagged so far. Overall he raised almost $33K, but over $20K of that is his own money. His donations come from the normal roster of conservative donors including Jim Jansen, David Boyle, Bob Griffin. and Chuck Spinelli. On the spending side, Taylor has spent or incurred debt of about $11K to get signs and other campaign materials. He still has about $20K left, but hasn’t done any media buys yet. Mr. Schimscheimer raised $27,275 in the roughly three weeks since he filed to run. That seems good, but $25K of it is his own money, so he only raised $2,275. That isn’t so good. His only notable donation was from Republican Party insider Lori Davey for $200. Schimscheimer has only spent about $9K so that leaves him with about $17K left for ad buys and other end of cycle expenses. Be the first to comment on "What We Learned About Anchorage’s Races Last Week"